The Chapel Choir, under the direction of the University Organist Dr. Roger B. Williams, comprises around 30 members of the University, both staff and students. 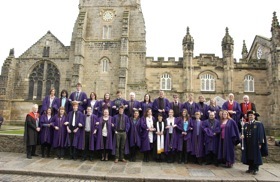 The singers are the successors of the 16 Vicars Choral of the original foundation of the University. They have a broad repertoire ranging from medieval plainchant to new works some of which have been specially composed. The Choir sings at the weekly University Service, at concerts and has in recent years made several broadcasts and recordings.